I met Missy about two years ago. 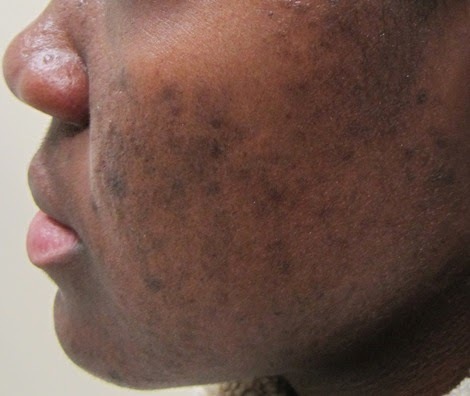 She suffered from mild acne and had dark spots from where previous breakouts had been. According to her she had tried all sorts of skin products and hadn't gotten any relief. As at the time I met her she was using a concoction of a local anti-acne product a doctor gave her and a lightening cream for the dark spots and claimed that was the only thing that was helping her. Fast forward to few weeks ago I met Missy again and sad to say the situation is still the same. She still claims nothing has worked for her and she’s never been to see a skin professional. Concealor is her friend however after covering the dark spots she’s left with the bumpy face makeup cannot hide. Hello everyone, I trust everyone's doing great. Today i'm excited to bring you a new kind of post, well on this blog anyways, and its going to be about nails. Although i wear falsies, I realized that most times i am somewhat conservative when it comes to nail colour or design always opting for the neutrals and nudes. I am on a personal challenge to be more creative when it comes to nail art. And to start that challenge here is a simple nail of the day very girly yet easy to re-create.